In the dead of night, the holy retreat is attacked by an elite group of warriors carrying ancient weapons. One by one, they hurl the silent monks from the clifftop to the rocks below ― the holy men taking their secret to their graves. Halfway across Europe, Richard Byrd fears for his life. He has uncovered the location of a historic treasure, but there are those who are dedicated to protecting it. Hoping to save himself, Byrd contacts Payne & Jones and begs for their help. The duo rushes to his aid in Saint Petersburg, Russia, and quickly find themselves caught in an adventure that will change their lives forever. “A fast and furious thrill ride with the perfect amount of history and humor blended in." 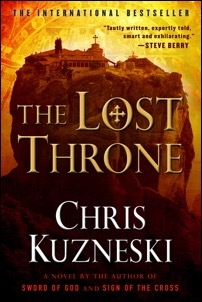 “Part Tom Clancy, part Dan Brown, THE LOST THRONE is fast, fun, and exciting!" In the dead of night, the holy retreat is attacked by an elite group of warriors carrying ancient weapons. One by one, they hurl the silent monks from the cliff-top to the rocks below ― the holy men taking their secret to their graves. Halfway across Europe, Richard Byrd fears for his life. He has uncovered the location of a historic treasure, but there are those who are dedicated to protecting it. Hoping to save himself, Byrd contacts Payne & Jones and begs for their help. The duo rushes to his aid and quickly find themselves caught in an adventure that will change their lives forever.